The results were absolutely wonderful: I bounced out of the treatment room feeling energized, but relaxed and stress-free. The Wellesleys spend their free time working for their favorite charity, the Pets and Animals Life Shelter (PALS), helping organize and participate in fundraisers and rescuing dogs and cats. Their own home houses a variety of four-legged friends they rescued, including a dog that had been in the shelter for nine months. (She is now deeply loved and happily spoiled.) Their other dog, Trixie, is ‘Ms. June’ in the PALS 2006 calendar. If you’d like to know more about PALS, please visit the PALS web site at www.palscc.org. ody-n-Balance Spa is proof positive that good things come in small packages. 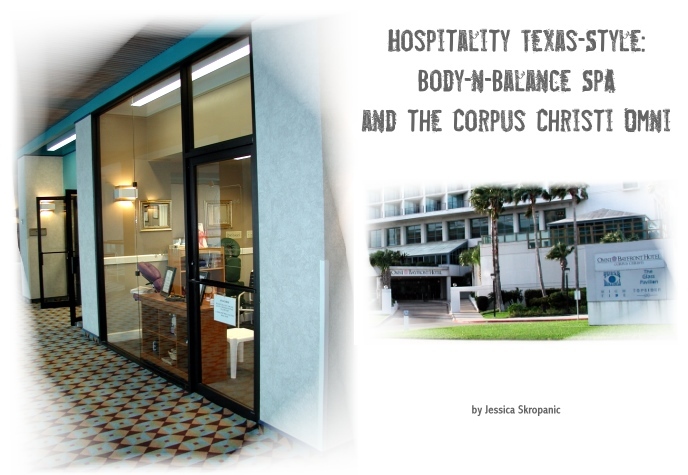 Located on the second floor near the fitness center and pool of the Corpus Christi Omni hotel’s Bayfront Tower, the spa’s two-room facility is modest in size, but big in hospitality – they’ll serve you 24 hours! 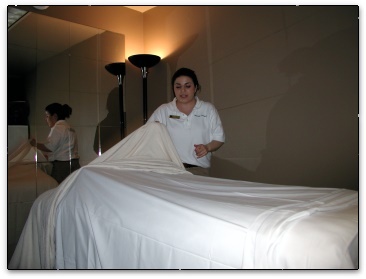 Many of the spa’s clientele are treated in their rooms as well as the massage room. With plans for opening two other branches in Austin and San Antonio within the next several months, Body-n-Balance is making a name for itself. Loyd and Monique Wellesley, the husband-and-wife team who own and manage the spa, and their staff of six massage therapists are what make Body-n-Balance feel larger than life in its tiny quarters. When the Wellesleys took over the facility from a single massage therapist eight years ago, they turned it from a quiet one-man show into a business that makes more money than any other hotel service except the bar in the Topsider Lounge. Formerly a Massage Therapy instructor specializing in medical massage in Dallas, Loyd met Monique when she was a student at the school. After she graduated they started dating and eventually formed an excellent team, combining business sense and vision with a passion for helping others. Although they are now facing the renovations throughout the hotel and have future plans to expand the spa’s facility, the Wellesleys have found creative alternatives to the usual spacious spa ambiance. They train their staff, most of whom were once Loyd’s star students, in good verbal and non-verbal communication skills. They aren’t just talented masseurs; they manage to be professional and still make you feel like you’ve known them for ages. The spa’s philosophy is that every client should feel that they are the most important person in the world. “We don’t have a fancy (facility), so we have to do more to make the clients happy,” says Monique. “When (clients) come in, we usually make them laugh.” Laughter is definitely a stress-reducer. The spa has plans to sell a variety of products, but at this time the s focus is on doing only one thing superbly – massage. Spa specialties include the Full Body Treatment package which includes a sea salt scrub for exfoliation, a mud treatment for detoxifying, and a hydrating moisturizing. ($150.00 for 90 minutes.) The Sparkler is the spa’s cleansing facial massage. ($78.00 for 45 minutes.) They also offer hand and foot bath treatments with massage (30 minutes for $65.00, 60 minutes for $120.00.). The spa’s menu also includes a paraffin body wrap, a hot stone massage for deep relaxation, a hand and/or foot reflexology massage, the basic Swedish massage for relaxation and stress relief, and deep tissue for muscle pain relief and releasing tension. Most run about $40.00 for 30 minutes, $75.00 for 60 minutes, and $115.00 for 90 minutes. They also offer chair massage for $1.25 per minute, and in-room 60-minute massages cost $120.00. Each member of the staff is each trained to perform a variety of treatments, and is happy to create a custom massage package to a client’s specifications. The sign on the spa’s door says the hours are 9am-9pm, but the Wellesleys are on-call 24 hours for weary travelers who can’t make it to the spa when it’s open. My first treatment package combined an original ‘Back to the Beach’ exfoliation with a Swedish massage with cocoa butter. Massage therapist Sandra ‘Lucky’ Longoria, a native of South Texas, began practicing massage (informally) at the ripe age of four. Her grandmother, a Native American healer, always kept eucalyptus in her home. On her first day of massage school Longoria walked into the classroom and smelled eucalyptus. “That’s how I knew I was home,” she said, smiling. Longoria mixed cocoa butter oil, coconut lime shea butter, and sea salt to create an exfoliating salt scrub that best said ‘Corpus Christi’ to her. She also scented her towels with orange. She brought me water before I entered the treatment room, so I was well hydrated during the massage. I felt my modesty was deeply respected: After I’d undressed she knocked and then waited for me to answer her before she reentered the treatment room. Her choice of music was a relaxing rhythm and pipe with nature sounds in the background. Somehow it all seemed to tie into the feel of the region. She applied the salt scrub in a relaxing circular pattern. The salts definitely exfoliated, but never felt like they were too harsh – and did they smell heavenly! After I was thoroughly exfoliated, Longoria provided a robe and rubbery flip-flop slippers for me, and escorted me two doors away to the ladies locker room where I showered off the scrub. After I toweled off, my skin felt very smooth and fresh. When I returned to the treatment room, Longoria gave me a wonderful Swedish massage with a bit of deep tissue thrown in because I was stiff from the plane ride. She used her own mixture of massage oil that included cocoa butter. My second treatment package consisted of the Sparkler facial massage and a full hot stone massage. My masseur was Leo Rodriguez. Rodriguez worked as an EMT before becoming a massage therapist. He became unhappy with the fact that so many of his patients were beyond his help that he went into massage therapy. Massage, he said, allows him to help people gain and maintain good health. The Sparkler includes a facial cleansing, scrub, masque, toner, and moisturizer, all with massage. The massage really helped relax my neck and head and had the added benefit of clearing my sinuses. My skin felt supple, hydrated and soft after he was done. Yes, it did seem to sparkle! Since the first time I experienced it, hot stone has been a favorite of mine. I was really excited to hear I’d get to experience the Body-n-Balance hot stone massage. Just as with the first treatment, my modesty was respected and I was given a choice of how much clothing I wanted to remove. Rodriguez quickly relaxed me with a wonderful back and neck massage – a sort of preliminary ‘tenderizing’. Next, he used the hot stones to give me a full body massage; never actually placing the stones on me and leaving them, but using them as a hand tool. I really believe that – for me – the hot stone massage is the best relaxation massage ever invented. The heat of the stones made each relaxing stroke penetrate deeply. It was like I’d gotten an internal as well as an external massage. Rodriguez began on my back and shoulders, worked on my arms, hands and legs, and then I turned over so he could do my feet and the other side of my shoulders and limbs. He also began and ended the massage with a deep breathing exercise and a bit of energy work. By the time Rodriguez finished, I felt very relaxed and toasty warm. After the treatments were over I again felt invigorated, not lethargic. In fact my muscles were so supple and warm that, when he asked me to turn over during my massage, Rodriguez commented that I did it very easily and quickly. When I left the spa I was definitely feeling fine, and my skin from face to feet looked younger and healthier, and felt soft and elastic. What a difference from the sore and weary traveler who’d disembarked from a three-flight plane trip at midnight, and had fallen into her hotel room 40 hours earlier! For appointments: contact Body-n-Balance at the Omni Bayfront at (361) 887-1600, extension 3180, or call the Wellesleys on their cell phone at (361) 215-8911. The hotel’s general manager Kevin Latone takes pleasure in the hotel’s relationship with Body-n-Balance, and believes that it instills the message in the guests that they are welcome to relax and indulge themselves. “We have a great partnership with Loyd and his team,” he said. “Our (main) market is a leisure destination. In fact, we’re the closest hotel to the Convention Center.” The latter makes the hotel popular with business groups as well as families. “Realistically, (the spa) should be an expanding business,” says Latone. “I’d like to give the spa more space.” Space is of a premium in the hotel, but both Latone and the spa staff have plenty of creative ideas regarding carving out a larger facility that is still in a quiet location and satisfies the spa’s needs. The Bayfront Tower offers a fitness center composed of a weight room with an assortment of hand weights and weight machines, and a separate machine room with treadmills, bicycle and elliptical stepper. “We have all new equipment coming (in May),” says Latone. Both workout rooms also have plenty of dry towels and a little refrigerator with stacks of rolled cold towels. The Bayfront has an indoor/outdoor pool next to a deep hot tub, and above it stretches a long sundeck with a view of the water. The locker rooms are equipped with a dry sauna and are very clean and well equipped with towels. All of these facilities are next to or just down the stairs from the spa. My hotel room in the Bayfront Tower also had a view of the water and the shoreline walkway dotted with gazebos. It was comfortable and equipped with a balcony, two desks, and plenty of room to stretch out in the overstuffed chair with ottoman. Scenically located in Corpus Christi’s Marina District, the Bayfront and Marina towers are situated one block from each other and are central to much of Corpus Christi’s nightlife, sailing, fishing, diving and other excursions such as the Texas State Aquarium and the Texas Treasure Gambling Ship. The towers (once two separate hotels) comprise 820 rooms. The hotel’s airport shuttle service runs every 30 minutes during peak hours. Many of the accommodations include views of Corpus Christi Bay. 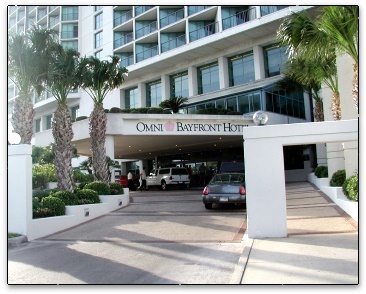 The port and the Bayfront Plaza Convention Center is a short cab ride) away. The ballroom and eleven function/meeting rooms are available for meetings, weddings, etc. Amenities include dual-line data port telephones, video game consoles, complimentary high-speed wireless Internet access and complimentary daily newspapers. Evening turndown service and terry-cloth bathrobes are available on request. Other features include a gift shop and beauty salon on the first floor or the Bayfront, tour desk/concierge, 24-hour front desk, express check-out, free parking, handicapped-accessible rooms, safe deposit box, and in-room clock-radios, coffee makers, data ports, hair dryers and irons/boards. Standard rooms range from $154 – $185 per night, and suites from $300.00 – $1,500 per night. (Rates subject to change. Call first.) Check-in time – 3pm, check-out time – 12 noon. The Bayfront’s Glass Pavilion Restaurant (second floor) and the Marina’s Coastline Café offer a sumptuous breakfast buffet for $10.95, with omelets made to order, a fruit bar, a pancake bar, a bar with classic hot breakfast fare like potatoes, scrambled eggs, sausage, bacon and biscuits with gravy. Expect to walk away full! There is also a pastry and muffin bar which I dutifully avoided, but by lunch I could no longer resist. I ordered the Glass Pavilion’s mouth-watering cheesecake, which comes in a Texas-size slice. Their lunch menu includes an assortment of sandwiches and salads with grilled chicken or shrimp. Full breakfasts run about $9.00-$11.00 and lunch menu items range from $6.00-$15.00 for everything from a-la-carte to full meals. The Topsider Lounge (Bayfront Tower) is a lovely place to catch the view of the water during the daylight hours. It offers relaxing ambiance and the service is as friendly and polite as the restaurants’. The Bayfront Tower’s room service dinner menu offers several of the entrees and desserts from the Glass Pavilion’s menu. Portions were large, so I made sure to visit the fitness center – twice! No visit to the Corpus Christi Omni is complete without a visit to the Republic of Texas Bar and Grill – unless you’re vegetarian. Steaks are the tradition here, and are they wonderful! They also offer an assortment of fish and game dishes. The view is gorgeous and the staff helpful, patient and friendly. (Is there any other kind in Corpus Christi?) Dinner entrees range from about $28.00-$38.00. My filet mignon was done exactly as I requested, and was delicious. I asked my three other dinner companions how they enjoyed their meals and the votes were unanimously positive. The dessert menu was long and we all ordered different ones. Everyone loved theirs and proclaimed it the best. I had the crème brulée. (I went back to the fitness room later that evening, but I doubt the hour-long workout made a dent in that meal. It was fun trying!) Check out the menus at the Republic’s web site.